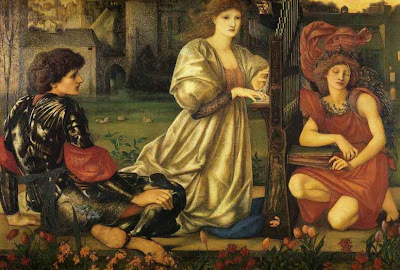 Georgiana was an accomplished musician and musical themes often appear in his works. The title here is from an old Breton song. 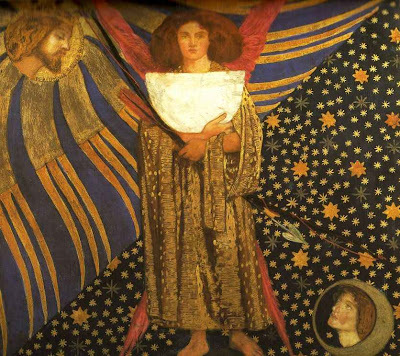 The original work was painted in 1864 on the inside lid of an upright piano (now in the V&A) and the full-sized painting was developed from this. Done for Morris and Company, probably his most complex design. 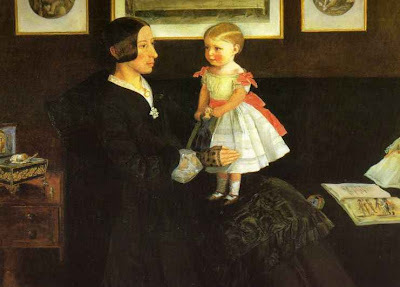 This very personal portrait shows Maria with Cupid and his arrow, the message attached to which reads, 'Mary Aetat XXVI August 7th 1870 EBJ pinxit'. She holds a medieval manuscript which contains a minature painting of his Chant d'Amour, emphasizing the ambuiguity of the pleasure and pain of his relationship with the sitter. Maria Zambaco was the cousin of Constantine Ionides, one of the artists most important patrons. 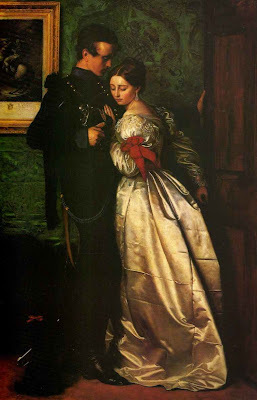 They negan an affair in 1867 which turned out to be stormy and led to his attempted suicide in the Regent's Canal. 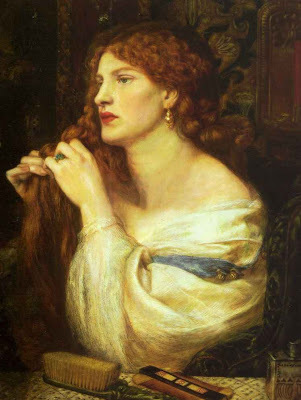 Later they ran off together but BJ was taken ill at Dover and he returned to Georgiana, though the affair continued for a few more years, Maria having to accept she would always be the Mistress and not the Wife. 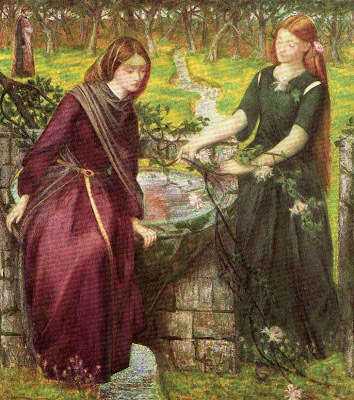 The first version of this work was done in 1864 as a watercolour. 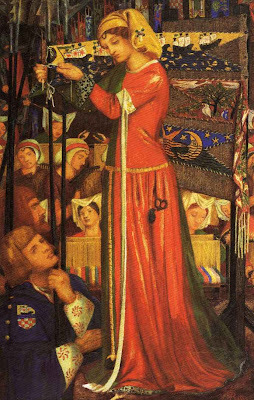 It features Georgina (in black, reading) and Louie and Jane Morris (holding the Peacock feather). 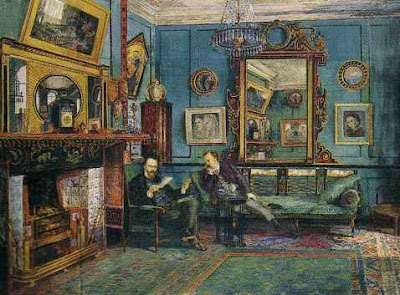 This version was exhibited in 1865 at the Old Watercolour Society to rather mixed reviews. 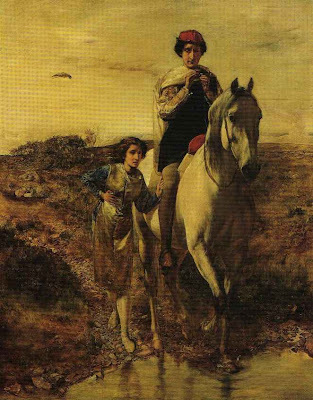 The oil seems to date to 1868 when it was bought by his patron William Graham. 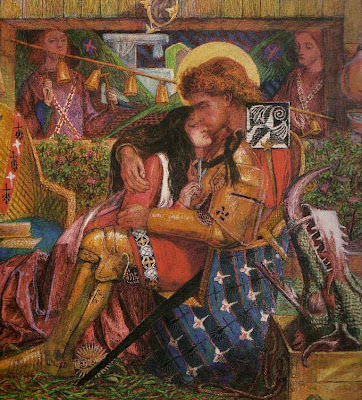 The artist Myles Birket Foster commissioned seven paintungs from Burne Jones on the theme of St George and the Dragon. 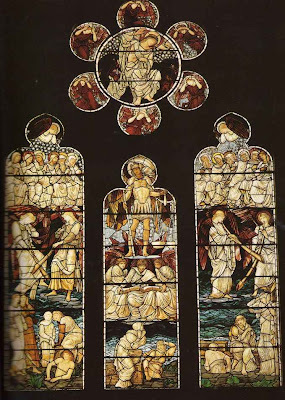 These were for his dining room at his house in Surrey which he had designed himself in 1863. BJ's assistanmt Charles Fairfax Murray seems to have helped on these and BJ retouched them before they were exhibited at the Munich International Exhibition in 1897 - winning the Gold Medal. 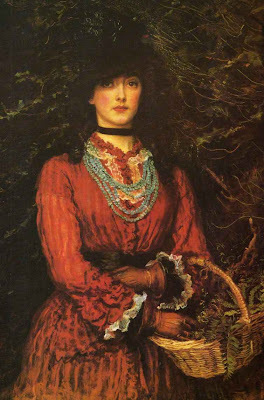 First wife of Holman Hunt (1833 - 1866), daughter of George Waugh. 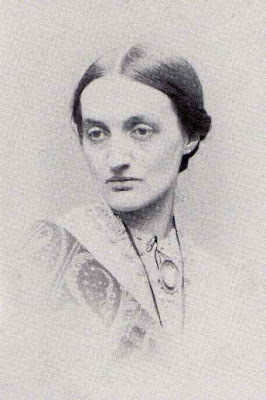 This photo was taken in December 1865 shortly before her marriage. 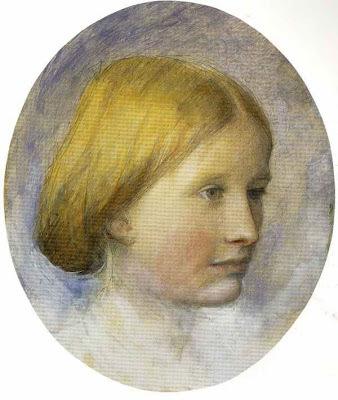 She died in Florence having given birth to Cyril in 1866. 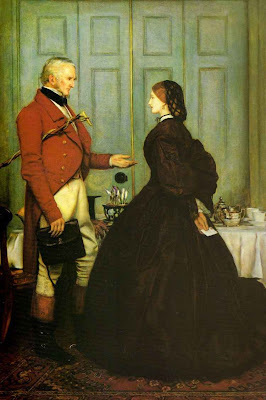 Her sister Edith became his second wife. 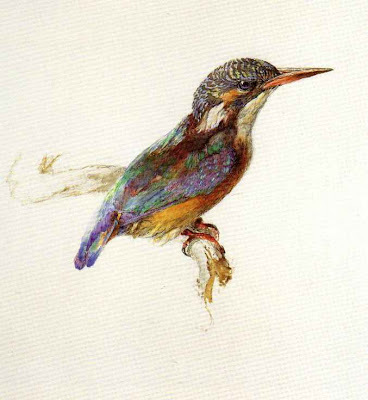 Watercolour, based on an oil original. 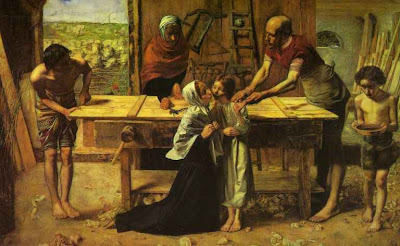 This subject followed on the phenomenal success of Millais' painting My First Sermon, exhibited in 1863. 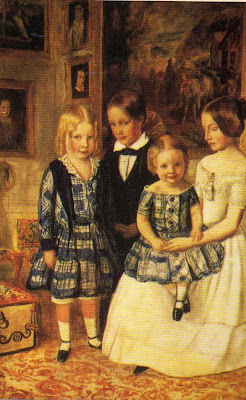 One critic noted: 'Everybody is rejoiced to recognise, sitting in the same place as last year, the little girl, now dear to many a heart, who then was listening…in rapt attention.' 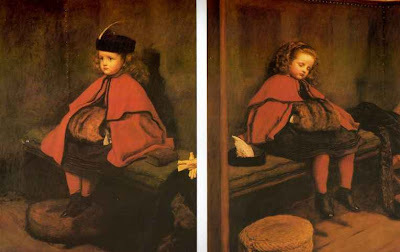 The image was widely reproduced as a print. inspired by Keat's poem of the same name. Commissioned by Lewis Pocock (Hon. Sec. 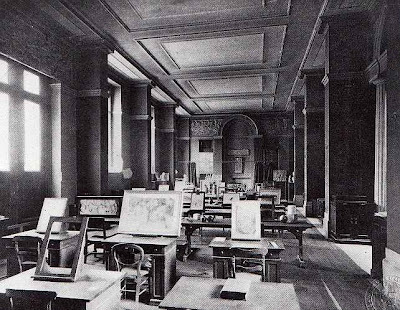 of the Art Union in London) in May 1852. 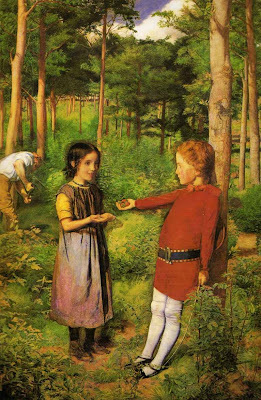 The scene was painted from an ancient tree on West Wickham Common which became known as the 'Millais Oak'. 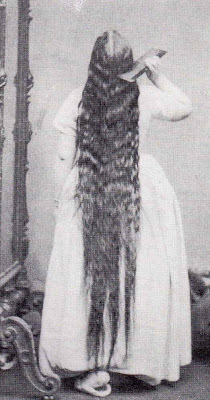 Anne Ryan was the female model. 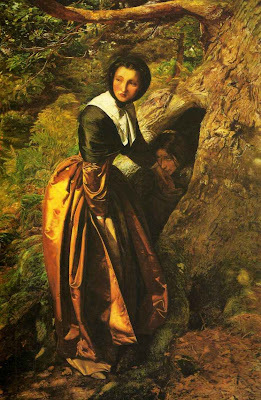 James Wyatt (1774 - 1853) met Millais about 1846 when he painted a watercolour of his granddaughter Mary. 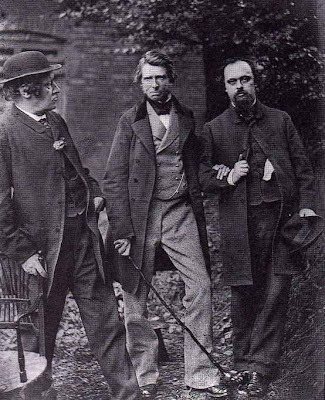 Wyatt was a collector and dealer (as well as being a print publisher and Mayor of Oxford 1842-3). 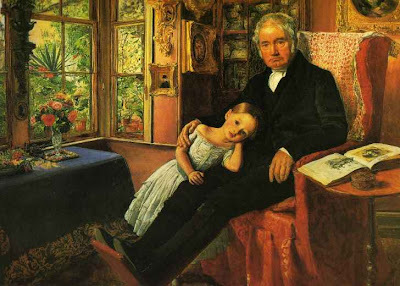 He commissioned several family portraits from Millais. This is really annoying. 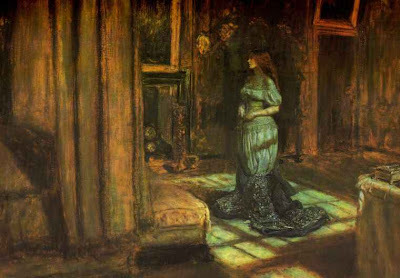 I have this down at Millais and I love it, but didn't record the name of the painting. Anyone know ?? 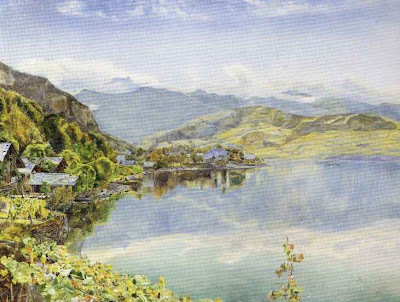 Inchbold made three visits to Switzerland between 1856-8. 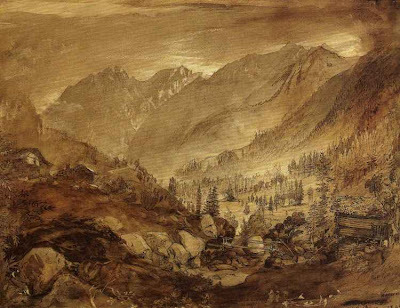 His decision to paint the Alpine scenery was influenced by Ruskins Modern Painters and Ruskin helped pay for the journeys by commissioning drawings and offering hospitality. 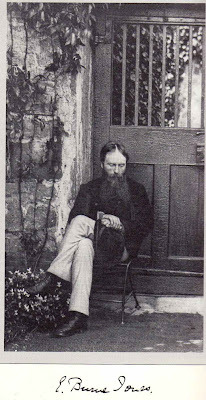 Ruskin wasn't particularly pleased with Inchbold's efforts and the pale colours go against the PRB's use of vivid colouring but seem more attractive today. 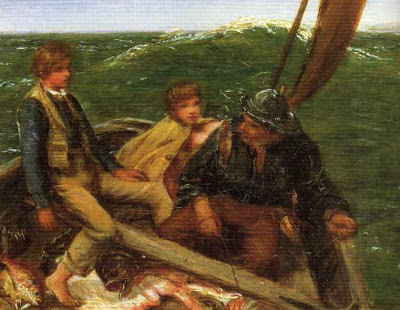 Cooke was a successful marine painter. 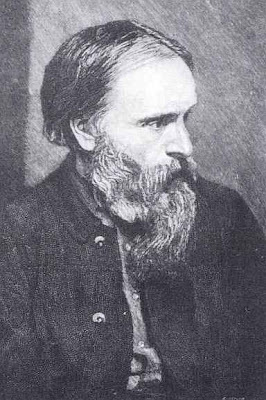 Ruskin met him in Venice and was impressed by his accuracy and his 'existence of clouds as a matter of serious interest'. 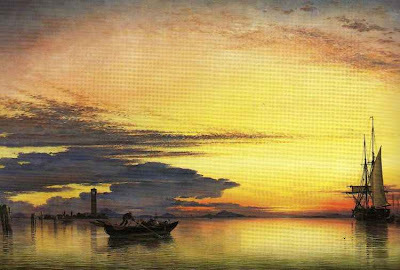 Hook was mainly known for his seascapes. Painted after his visits to Clovelly in North Devon. 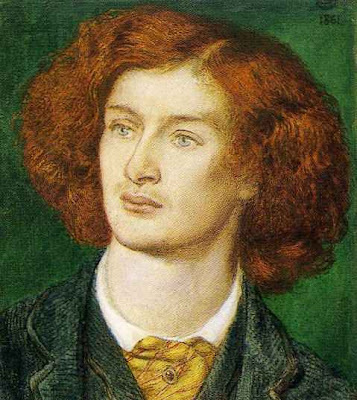 Hook painted a Pre Raphaelite naturalism in the 1850's. 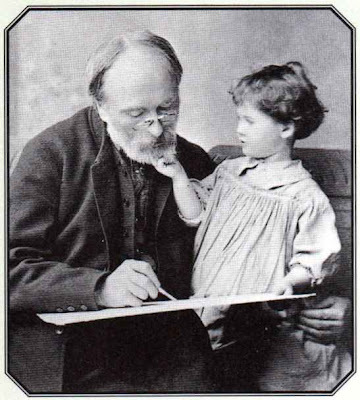 Henry Le Jeune [1819 - 1914] was heavily influenced by Ruskin's book The Elements of Drawing (as were many others before and since) which traced Ruskin's progress as an artist and draughtsman. 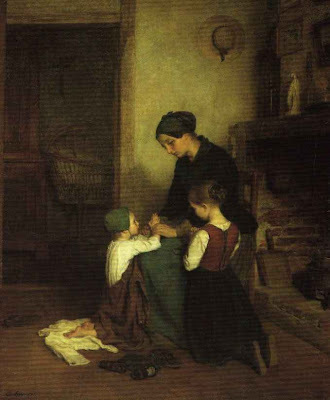 Le Jeune was himself a drawing master who had worked in this role at the Royal Academy since 1845 (he became its curator in 1848), and was elected an Associate in 1862. 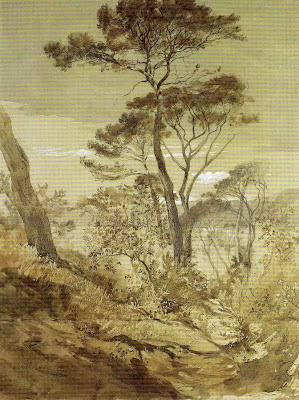 Though his first love seems to have been historical subjects (including biblical themes) this picture seems to be based on Ruskin's dictms on drawing style, especially to do with trees as a useful subject. 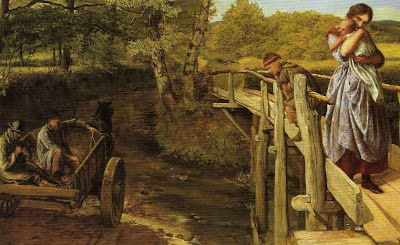 French genre painter admired by Ruskin. illustrates a Scottish ballad in which a cruel lover is won over by the devotion of Burd Helen. 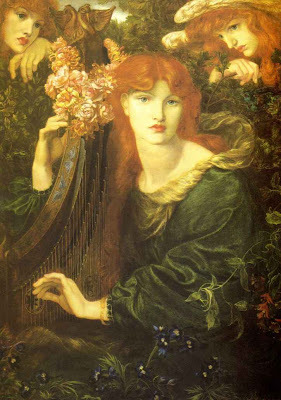 Rossetti and Ruskin admired this picture and was considered Pre Raphaelite in style and intent. 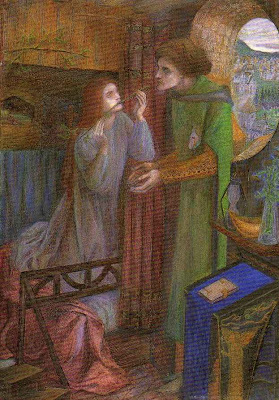 Windus was a Liverpool artist. 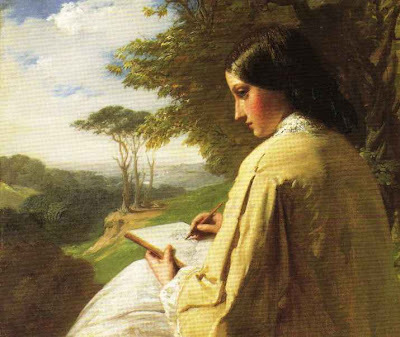 Commissioned for £50 by Charles Eliot Norton. 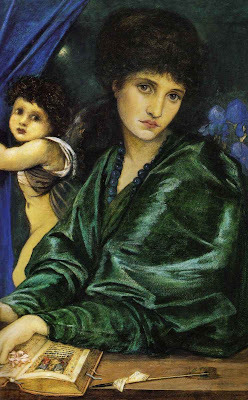 Ruskin disliked it and Rossetti had to retouch it to his satisfaction but Rossetti never considered it one of his best. 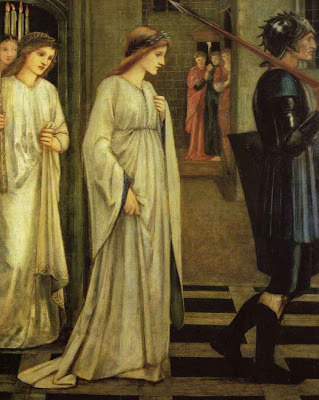 Ruskin commissioned Rossetti to make some illustrations from Dante in April 1855. This was completed by October but considered it rather rushed. 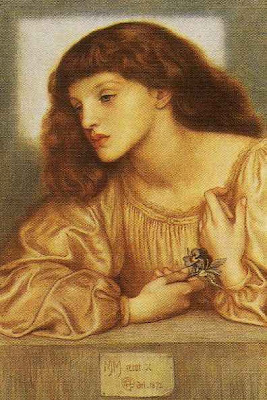 Elizabeth Siddal modelled for the girl with the purple robe - Leah. 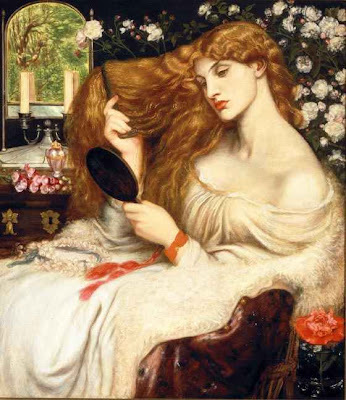 Although perhaps best known as a model for Deverell, Holman Hunt, Millais and Rossetti she proved to be a more than capable painter herself. 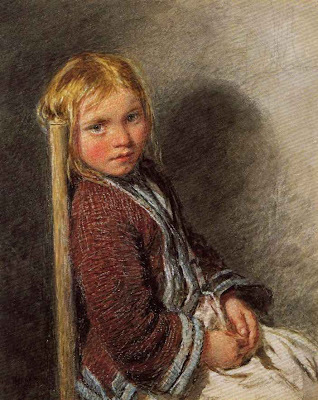 This was painted in 1857 in Watercolour, bodycolour and coloured chalks. 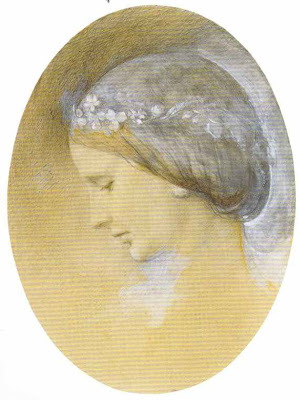 Ruskin bought a lot of her works and was very enthusiastic about her abilties. 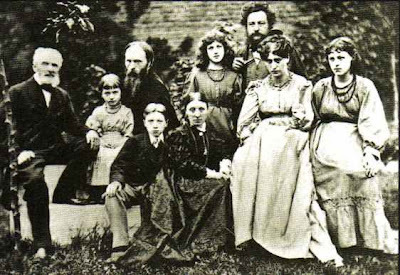 He arranged to give her £150 / annum for any work she produced (although this arrangement ended sometime in 1857). 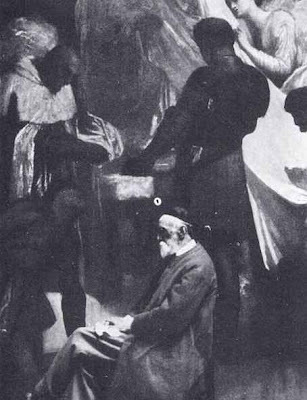 Clerk Saunders is a scene from Sir Walter Scott's Minstrelsy of the Scottish Border.